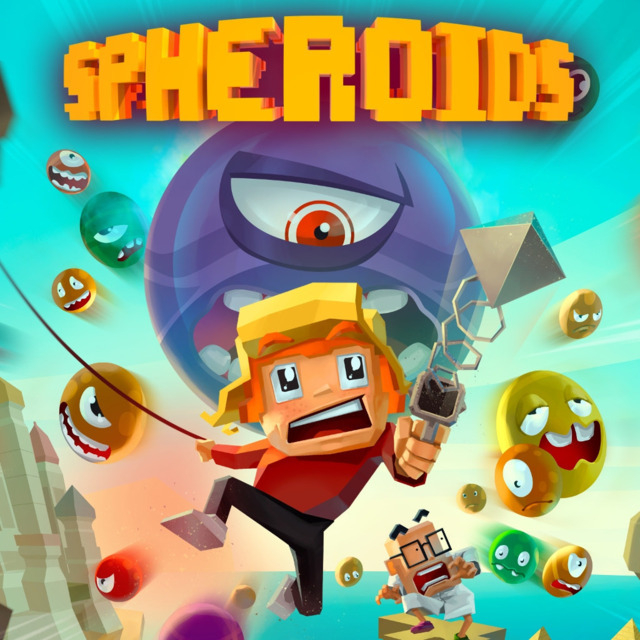 Spheroids is developed by Eclipse Games, the same group responsible for Tachyon Project, which was spoken of highly by Josh Speer. 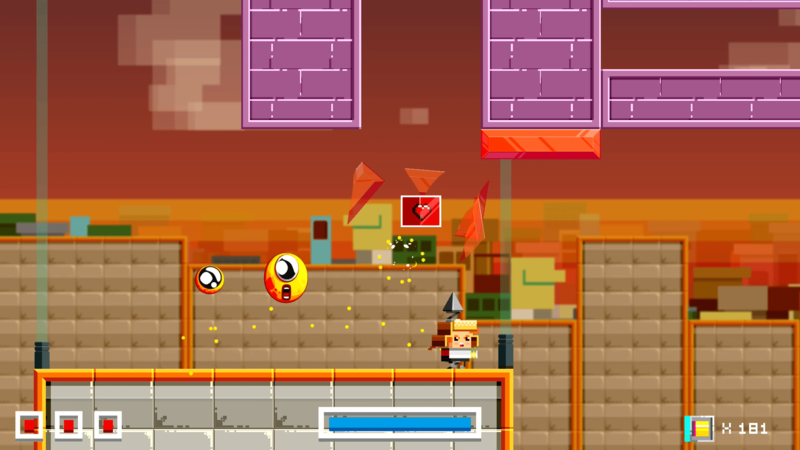 Spheroids is a platformer where you can only shoot above or below you. While an interesting style, can it hold up on the PS4? Let’s find out! Most story cutscenes serve as either a tutorial for a new mechanic or just comedy. The story follows a young boy named Lucas who comes under attack from the monsters known as Spheroids. 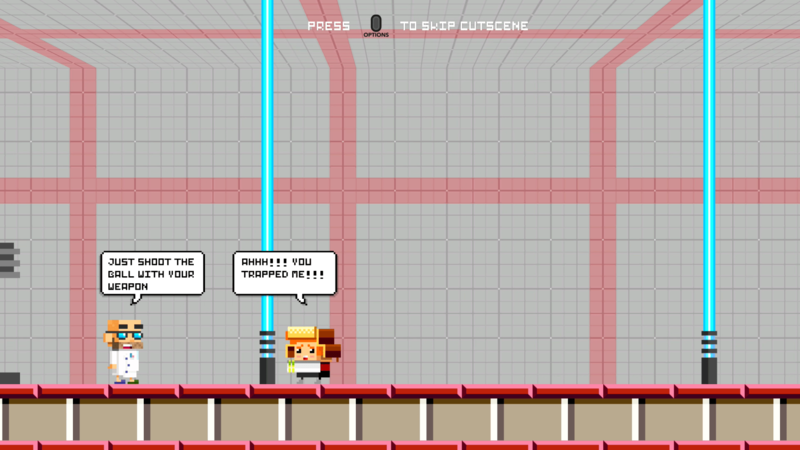 Professor Otto helps create a device so Lucas can fight against the Spheroids and save the world. That’s mainly it from the story, as there is no character development and Lucas just instantly does whatever Otto says despite his initial cowardice. The game tries to add bits of humor at the beginning of each chapter when Otto introduces a new mechanic. One bizarre thing was getting close to the final chapter, when Otto introduces another Spheroid that is claimed to be new… except I had already killed a ton of them a few chapters ago. The presentation is fairly decent, bright and colorful too. Everything is nice and clear to see, with a mix of pixels and voxels. This allows for the Spheroids to have a much different shape than the protagonist, giving off more of an otherworldly vibe and how these monsters are indeed vastly different from Lucas. Problems slowly emerge though, as the camera doesn’t have enough of a view of the areas, or there are times when the stages can sometimes overlap and make things a tad harder to see after using a teleporter in the game. The worst offender of all was the music, as sometimes it just cuts out or it would recycle through a bunch of other songs, failing to make stages feel more unique. You can likely just insert your own songs through a playlist and it will have the same effect. It’s decent stuff but that’s about it. 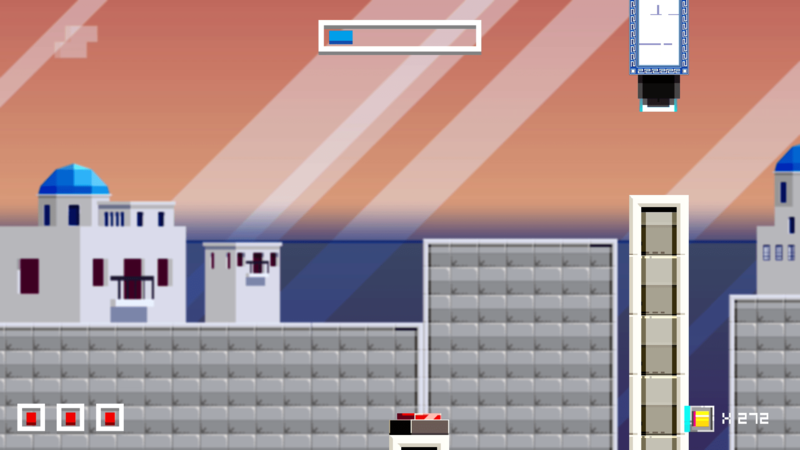 Power-ups are thankfully clear to see, though can sometimes get stuck between platforms. The platforming itself is okay but that’s it, as nothing really stands out. It tries to mix a ton of things together, such as a grappling gun to swing to obstacles, gravity boots to walk on the ceiling and much more. However, there are problems in the execution as these mechanics feel a bit delayed. 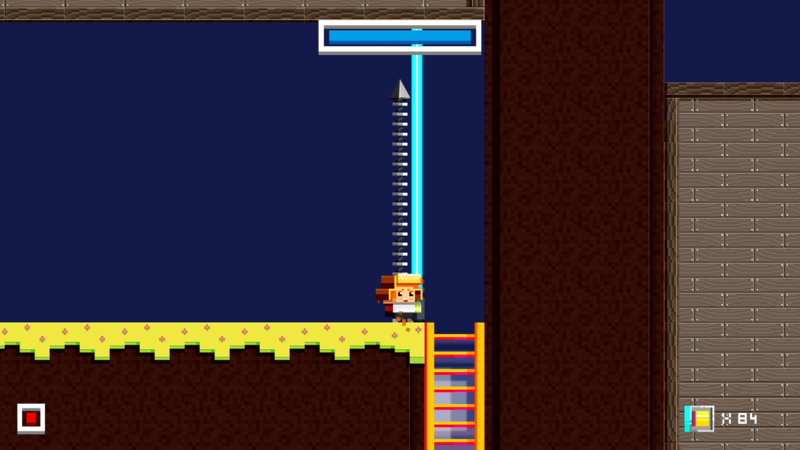 One example are the gravity boots, as they would not work or were delayed enough that while trying to jump, I would go into the hole due to such tight jumps in later levels. Other examples include shooting either the grappling hook or your weapon, though this is because holding down the button will cause you to pause until it is released. The grappling hook also seems to prioritize certain spots, even moving past walls somehow to get its target for the hook, and screwing up the platforming plan at times. This even caused me to hit the spikes, which in this case were actually Spheroids acting as spikes. Some enemies can divide and reform. 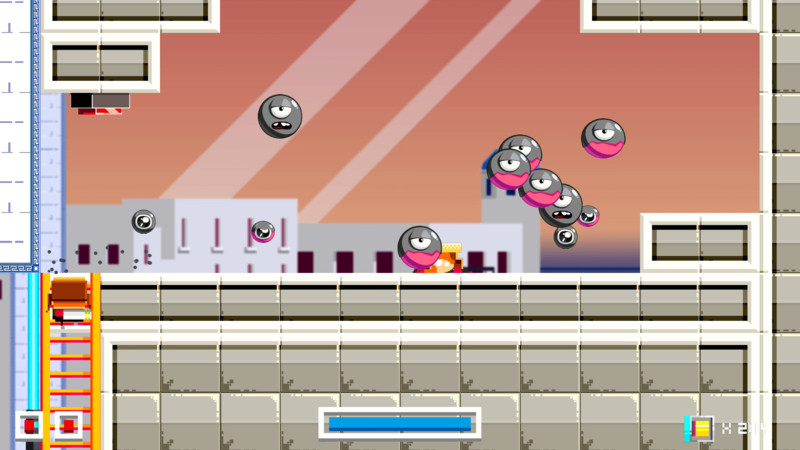 As you can expect, the enemies are all floating spheres with little variety. Some move slow, some move fast, some divide and can form bigger spheres if they join together, some require more hits, etc. The greatest threat will always be their numbers, as it is possible to divide the Spheroids too much and be quickly overwhelmed since you can only shoot up or down. Sometimes the obstacles can prove to be the biggest challenge, though all of this felt negated when death had no consequence. Thanks to the checkpoints, I just had to worry about the platforming, throw myself against the enemies until I died, revive, and keep going. The metal spheroids take many more hits to kill. 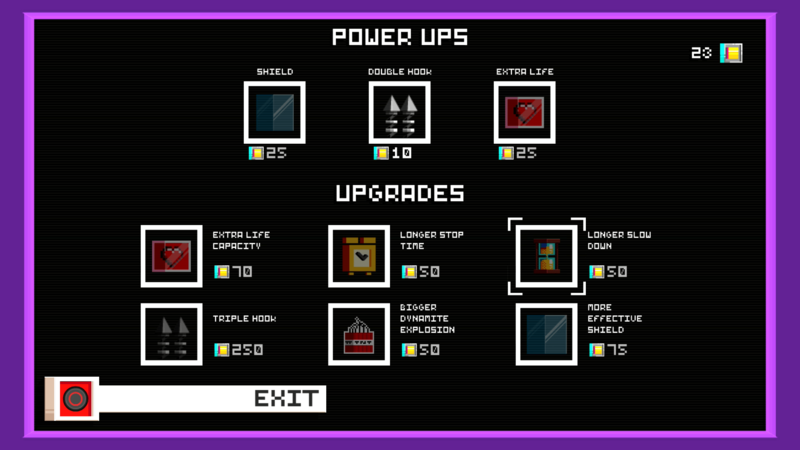 Power-ups can be found occasionally in the stages, and even upgraded. For example, there’s a double-shot that allows you to shoot twice as fast, and that can be upgraded to a triple-shot. You can even just buy power-ups. The problem is that they reset after you die once, so buying a power-up felt pointless when I had to find it within the stage anyway, and sometimes platforming could result in me getting killed, or from an enemy suddenly coming into view. Upgrades thankfully do not suffer the same fate, and will likely be where your money goes first. This menu is only accessibly in the beginning of some stages. The game is also loaded with glitches that really need to be patched out. In a few sections, I found the camera suddenly zooms in really close or doesn’t zoom out, leaving my vision blocked and causing me to die unless I completed the platforming obstacle the way the game seemed to want it done. Then there was trying to shoot from the ceiling during sections where I had to use the gravity boots, where sometimes when I moved while shooting, I would automatically fall but sometimes I wouldn’t. The invincibility frames also felt as if they did not exist sometimes, as I could suddenly be hit multiple times yet not have that happen on another run. I will give you a cookie if you can pinpoint exactly WHERE I am on this screenshot. Hint: even I don’t know! There’s one enemy in particular that seemed to randomly kill me despite being at full health, or it would sometimes only do a little bit of damage. Some areas where you are forced into killing all enemies could also randomly just have the barriers vanish, letting me speed by with ease. Perhaps the worst glitch was when enemies got stuck in between platforms, or even outside of the barrier, so I couldn’t kill the enemy and had to restart the entire level all over again. Wouldn’t be a problem for Mega Man. Just saying. 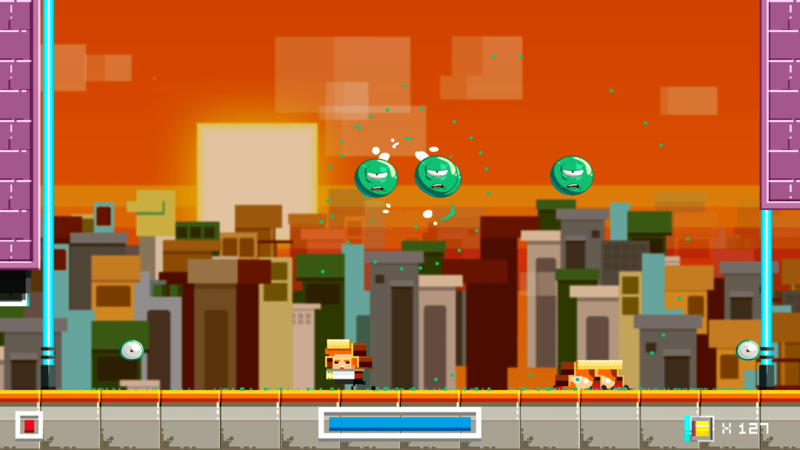 Spheroids is sold for $7.99 and I beat it in about 5-6 hours, with plenty of deaths. A skilled player can likely finish this in even less time. If you are interested in this game, at the very least wait until it’s patched out, provided that the developers are working on one. Review copy provided by publisher and played on a PS4 Slim. Next Post:IMPRESSIONS: Time Leap Paradise SUPER LIVE!